Sometimes a little simplicity is a good thing. For players out there seeking a basic racebook, Sports Interaction provides a standard wagering platform for all major North American racetracks while boasting excellent customer service and site security. Located in Canada, Sports Interaction sportsbook has been in the game since 1997 and offers an alternative to offshore online betting. The Sports Interaction wagering platform displays live tracks odds and an exceedingly easy-to-use wagering menu. Featuring daily action from around North America, the Sports Interaction racebooks is similar to many in the industry that limit the maximum amount of profit and bet a player can make based on the category of the track where the bet is made. For example, "Category A" tracks includes 17 major tracks like Churchill Downs, Belmont Park, Santa Anita, and Del Mar. For all bets made on category A tracks, payouts are capped at $25,000 with a maximum bet of $250. Essentially, this kind of limitation isnt prohibitive for most active horse players, but would pose some issues for larger players. 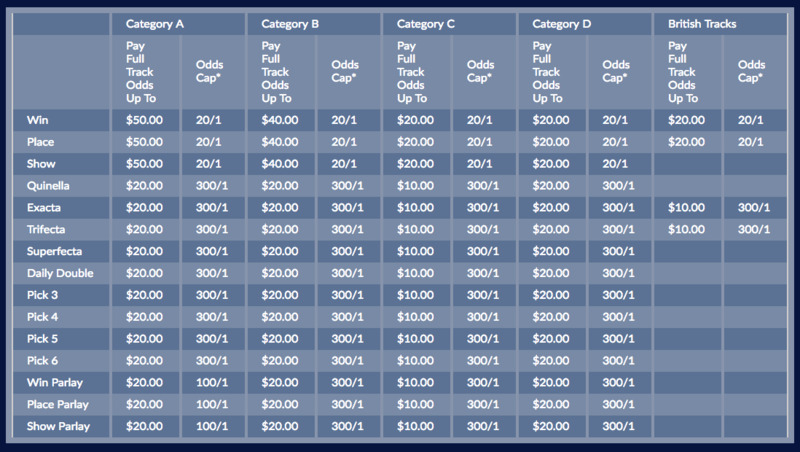 Similarly, category B tracks limit payouts at $15,000 and max bets are capped at $200. Sports Interaction features a racebook that supports all conventional and exotic wagers including the superfecta,pick 4 and pick 6. Offering up-to-the minute odds, Sports Interaction features live racing from virtually every North American track and action from Dubai. There's nothing like the thrill of betting horses and watching the action unfold as the gates open and these massive, talented athletes hit full stride at some 40-plus miles per hour. Sports Interaction's simple, no-frills site allows bettors to focus on what's important: catching the action and picking winners. Digging around the internet for race results is a major hassle for players trying to figure out who won the race they just missed. Sports Interaction players can find the results just minutes after they become official at the track. Additionally, players with questions about results or bets can easily rach Sports Interaction's helpful customer service staff via live chat 24/7 or by phone. While the Sports Interaction blog is primarily geared towards sports bettors, articles and tips catering to horse players can be found prior to the Triple Crown series and big racing events such as the Breeders' Cup. In general, Sports Interaction is a great platform for small to intermediate players and even supports the needs of some larger players. The site features a simple mobile betting app and also offers virutal racing for those inclined to try something a bit different. Unless you enjoy playing at intervals greater than $250 a race, Sports Interaction has all the essentials to keep you in action and enjoying the sport of kings.